The beach of St Heliers is a beautiful safe swimming bay and is only 2 mins walk down the road. The apartment has a peep of the bay and harbour and is quiet and peaceful. The BBQ area has full facilites with outdoor table, umbrella etc. Full kitchen. Sky TV and free WiFi available. Also 5 min walk to village with shops and and licensed and BYO restaurants. Buses only 2 mins down the road to go to the city. Parking available off road.Complementary full breakfast ingredients given for first night of stay. Wonderful bird life in the palms and bushes. Smoking allowed outside in the garden. My husband and I are retired and enjoy golf and cycling and skiing in our winter house in Queenstown We rent out our apartment and meet people from all over the world. 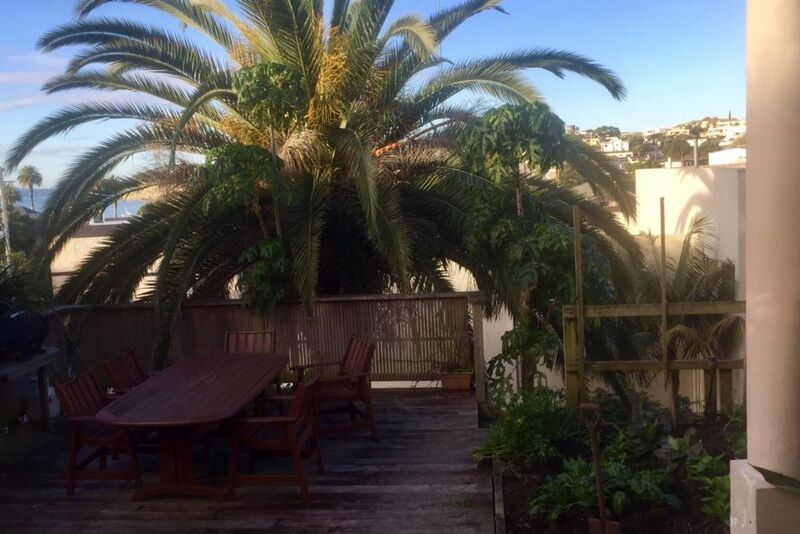 The back of our property has three vegetable gardens, palm trees,a hen coop and other pretty trees. A private deck and large BBQ area with table and deck chairs. Close access to the beach, shops,bars and cycle trail to the city. Really nice property in a great location. Really nice property in a great location. Everything available for a short or longer stay. Thank you Cathy - hope to see you again soon! This is our second stay at Cathy’s and we are going back for a third soon! This is our second stay at Cathy’s and we are going back for a third soon! The place is marvellous; we feel cocooned and welcomed and love the little touches that make it so homely. Wonderful place to rest and even work from if need be. It’s a pleasure to return soon. Handy to rgexwaterfront, cafes and amenities. Handy to rgexwaterfront, cafes and amenities. Nice extra touches with food to get you started. Very pleasant stay. Quiet and private. Highly recommend. Comfortable, clean and all needs met! Enjoyed the food left for breakfast. Comfortable, clean and all needs met! Enjoyed the food left for breakfast. Even my favorite chocolate. Would definitely stay again. Very quiet and great location for walks , cafes etc. What a fantastic property. So sunny, private, spacious and centrally located. The welcome fruit and breakfast was a blessing and very much appreciated. I highly recommend this apartment for 2 people.